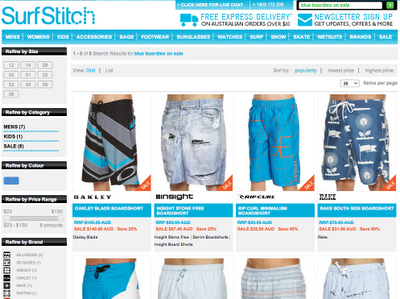 Loving site search on Australian surfwear online retailer www.surfstitch.com. Above are search results for the phrase: 'blue boardies on sale'. The results are 8 pairs of blue boardies on sale on the site. Bam. via @GrantArnott and built by SLI Systems. It is a wonderful site with a very successful story. I am happy to report that I represent the company from New York that built it. (http://www.ecommercepartners.net/). In fact I am meeting Gil Levy for dinner tonight.